This section on curriculum is part 3 of the Math Methodology series on instruction, assessment, and curriculum design. Goals "represent the knowledge, concepts, and skills all learners should master, and are generally aligned to standards. ... Methods are generally defined as the instructional decisions, approaches, procedures, or routines that expert teachers use to accelerate or enhance learning. ... Materials are usually seen as the media used to present learning content and what the learner uses to demonstrate knowledge. .... Assessment is described as the process of gathering information about a learner’s performance using a variety of methods and materials in order to determine learners’ knowledge, skills, and motivation for the purpose of making informed educational decisions" (What is meant by the term curriculum? section ). Peter Oliva (2005) defined curriculum as “a plan or program for all the experiences that the learner encounters under the direction of the school. In practice, the curriculum consists of a number of plans, in written form and of varying scope, that delineate the desired learning experiences. The curriculum, therefore, may be a unit, a course, a sequence of courses, the school’s entire program of studies—and may take place outside of class or school when directed by the personnel of the school” (p. 7). How is curriculum developed? The Center for Applied Special Technology (CAST) advocates developing curriculum based on universal design for learning (UDL) principles, which stem from research into how individuals learn and process information through the recognition, strategic, and affective networks of the brain. According to CAST, a universally-designed curriculum offers multiple means of representation, engagement, and expression. "UDL provides a blueprint for creating flexible goals, methods, materials, and assessments that accommodate learner differences" (CAST, n.d., What is Universal Design for Learning?, para. 3). CAST provides a UDL Curriculum Self-Check for checking curriculum for those goals, methods, materials, and assessments. Curriculum needs to be accessible by all learners. Cynthia Curry of Maine's Learning Technology Initiative has an excellent presentation in iTunes on UDL and Accessibility. The goal of this presentation is to help ensure "access to the curriculum for all students" and includes examining "tools, resources, and strategies for supporting all students, including students with disabilities and students from diverse cultural and linguistic backgrounds." Educators have been challenged to develop curriculum to best address standards, as multiple organizations, including national associations, states, and provinces, have established content standards for what students should know and be able to do. In many cases, there have been just too many standards identified, which has led to a surface covering of many without the depth required for true understanding. Because of so many standards, many educators have relied the order of content presented in a textbook to specify the curriculum and content they teach. In doing so, one might find topic area gaps in instruction. Some educators might leave out areas they don't feel comfortable teaching, such as statistics, probability, and data analysis in mathematics. Their own knowledge might have a gap. In other cases, teaching to the text might lead to too many content-overlaps for students. If a textbook is a primary source of content for instruction, "Finding the best textbooks for standards-based teaching and learning is possible only after the district has determined the grade levels and sequence in which critical standards are to be taught" (O'Shea, 2005, p. 37). This latter process involves many individuals. However, the rise of open education resources has led to a decline in relying on textbooks, which in turn has created another difficulty for teachers who now are faced with finding their own internet resources. This adds to the difficulty of creating a unified curriculum for all learners at each grade level. As one teacher lamented, "With no textbooks, every teacher becomes an improvisational curriculum designer, which they try to do on--the--fly while also teaching their classes every day" (Norris & Soloway, 2017, online p. 3). Norris and Soloway (2017) reinforced that "curriculum is a product of an active design process" (Norris & Soloway, 2017, online p. 1). Adequate planning among educators is essential and an ongoing process for effective teaching. Identifying the learning progression toward mastery of any topic is not easy. James Popham (2007) pointed out that "with few exceptions, there is no single, universally accepted and absolutely correct learning progression underlying any given high-level curricular aim" (p. 83). Task analyses by different educators will yield different progressions; however, the important point is "any carefully conceived learning progression is more likely to benefit students than teachers' off-the-cuff decision making" (p. 83). A number of documents have been developed to assist districts with curriculum and implementing standards. The National Council of Teachers of Mathematics developed Curriculum Focal Points for Prekindergarten through Grade 8 Mathematics: A Quest for Coherence (NCTM, 2006), which outlines the most important math topics for each grade level Pre-kindergarten through Grade 8. Focus in High School Mathematics: Reasoning and Sense Making (NCTM, 2009) addresses mathematics education in high school by providing reasoning opportunities in five areas: numbers and measurements, algebraic symbols, functions, geometry, and statistics and probability. Of particular significance is the eBook, Making it Happen: Common Core State Standards (NCTM, 2011), which is a guide to interpreting and implementing the CCSS for mathematics. Educators should not wait to incorporate Conley's recommendation. Note: The Common Core Toolkit, posted at EngageNY.org, includes resources for implementing the standards and a Common Core Video Series. Students need both quality instruction and quality curriculum. However, typical instruction in schools has suffered from the "twin sins" of "activity-focused teaching and coverage-focused teaching." In both cases, "there are no explicit big ideas guiding the teaching and no plan for ensuring the learning" (McTighe & Wiggins, 2005, p. 3). McTighe and Wiggins provide the Understanding by Design (UBD) framework for curriculum mapping. A successful mapping program as described by Heidi Jacobs (2004) in Getting Results with Curriculum Mapping will help to ensure "measurable improvement in student performance in targeted areas" and a "process for ongoing curriculum and assessment review" for schools and districts (p. 2). A long-range map serves as a horizontal and vertical alignment mechanism for operational curriculum within a district or school. All teachers benefit from short-range unit curriculum maps and year-long curriculum maps because the curriculum map is like a blueprint for aligning content and skills to be taught, and assessments (Jacobs, 2004). The essence of curriculum mapping is that it is "an approach to curriculum and instruction designed to engage students in inquiry, promote transfer of learning, provide a conceptual framework for helping students make sense of discrete facts and skills, and uncover the big ideas of content" (McTighe & Wiggins, 2005, p. 4). Maps can help educators identify gaps in instruction, places where repetitions occur, and places where content might be integrated across subject areas. Maps help educators to decide what should stay and what should be cut from instructional units to best address essential standards. They can assist with pacing and differentiating instruction. If you are not familiar with curriculum mapping, Heidi Jacobs provides resources at Curriculum21. The Rubicon International Podcast Channel will help you keep up on the latest developments in education, technology, and curriculum mapping. Among podcasts are Why Map?, The Road to Mapping Quality, and Curriculum Mapping: Prologue and Setting the Stage, which are episodes 1, 3, and 9, respectively. The curriculum we teach should revolve around enduring understandings that we wish all learners to have about mathematics and any other disciplines. In the words of Carol Ann Tomlinson and Jay McTighe (2006), this will help "uncover" the content standards deemed essential. Understanding by Design (UBD) is a model of curriculum development that focuses on what to teach and how, and the assessment evidence to collect. It is the companion to differentiated instruction. McTighe and Grant Wiggins (2004) defined the model, which is often called “Backwards Design,” as a three stage process in which alignment is a key word. The model is useful for both short range and long range planning. Stage 1, Desired Results, includes writing goals linked to state and national standards, identifying enduring understandings (the "Big Ideas") framed as full sentences, writing essential questions tied to those understandings, and identifying what students will know and be able to do (skills). Enduring understandings cannot be read in a book. They are abstract and require “uncovering.” The understandings need to complete the stem, "Students will understand that..." The essential questions need to be provocative and engaging enough to serve as a hook for students; good essential questions will lead to retention and transfer. Foundational knowledge and skills need to be a comprehensive list of facts and skills to underpin the unit (McTighe & Wiggins, 2004). Jay McTighe (2013) provided seven characteristics of an essential question in Essential Questions: Opening Doors to Student Understanding . An essential question is open-ended, thought-provoking and intellectually stimulating, calls for higher-order thinking and "cannot be effectively answered by recall alone." It "points toward important, transferable ideas within (and sometimes across) disciplines," raises additional questions, requires support and justification, and "can and should be revisited again and again" (p. 3). What students know and will be able to do are closely tied together, but are not the same. Jane Pollock (2007) distinguished between declarative (content mastery) and procedural (skill mastery) knowledge. "In a curriculum document, the statements of declarative knowledge (facts, concepts, generalizations and principles) are identified by the words understands or knows" (p. 35) that "serve as placeholders for active verbs, which translate into activities and experiences that help students organize declarative knowledge." For procedural knowledge, a statement of student learning would begin with "a verb that describes the steps that need to be practiced to attain automaticity such as add, compose, sing, draw, or graph" (p. 36). The latter requires extensive repetition and practice. In terms of differentiated instruction, the established goal (content standard), understandings and essential questions should not be differentiated. Knowledge and skills may be differentiated (Tomlinson & McTighe, 2006, p. 36). Stage 2, Assessment Evidence, includes development of performance tasks and providing other evidence of learning. "A performance ability lies at the heart of understanding" and is linked to a real work task that an adult might typically do. It is the "evidence of being able to transfer what we know" (McTighe & Wiggins, 2005, p. 7). Performance assessments should involve meaningful, authentic, and engaging tasks. Such tasks "are better suited to assess more complex concepts and 21st century skills, such as mathematical reasoning, scientific investigations, issues analysis, creative problem solving, oral communications, and technology applications" and should "include both content specific and interdisciplinary performances." Teachers should implement them "as part of the curriculum at designated time periods during the school year" (McTighe & Wiggins, 2011, p. 17). Rubrics, which are criterion-based scoring tools, should be included by which you and learners can assess their products or performances. They should have point values attached to assessment criteria, with the traits specified from greatest to least strengths. For example, a four-point scale (high to low) might include criteria for exceeding expectations, meeting expectations, almost meeting expectations, and not meeting expectations. Care should be taken that the rubric is easy to use. Other evidence of learning should include opportunities for student self-assessment and self-adjustment based on feedback (McTighe & Wiggins, 2004). In terms of differentiated instruction, performance tasks and other types of assessment evidence may be differentiated. Response modes might have been orally, visually, or in writing. However, key criteria for evaluating should not be differentiated, as they are linked to content goals (Tomlinson & McTighe, 2006, p. 35). Results from performance tasks and rubrics might be placed in a Student Standards Folder, as part of a "systematic collection of assessment evidence related to Core Standards and other important educational goals" (McTighe & Wiggins, 2011, p. 17). W indicates that you are helping learners to know where the unit is headed and what is expected from them. You are also determining what their prior knowledge is. Strategies: Provide rubrics with examples from prior student work tied to different levels of the rubric. H stands for the need to hook the learners and hold their interest. Strategies: Hooks might take the form of "provocative essential questions, counterintuitive phenomena, controversial issues, authentic problems and challenges, emotional encounters, and humor" (Tomlinson & McTighe, 2006, p. 123). E is equipping learners to succeed, enabling them to experience key ideas and explore issues. Strategies: Provide a balance of constructivist learning experiences, structured activities, and direct instruction. R is providing opportunities for learners to rethink and revise their work and understandings. Strategies: Rethinking and revision might be encouraged by "playing the devil's advocate, presenting new information, conducting debates, establishing peer-response groups, and requiring regular self-assessment" (Tomlinson & McTighe, 2006, p. 124). E, again, allows students to evaluate their work and set future goals. Strategies: Provide regular opportunities for students to develop metacognitive skills of self-evaluation, self-regulation, and reflection. T stands for tailoring to accommodate the diverse needs, interests, and abilities of learners, including those with special needs who might have individual education plans. Strategy: Provide options for assignments with levels of difficulty associated with learners' knowledge levels, interests, and abilities. O stands for organization to sustain engagement and the learning process. Those who have experienced this process might conclude that it is not so “backward” after all, in that by identifying goals and enduring understandings at Stage 1, educators can complete a unit development aligned with those understandings and thus avoid instruction that does not focus on those outcomes. ASCD has a collection of resources to learn more about UBD. Source: Guskey, T. (2005). Mapping the road to proficiency. Educational Leadership, 63(3), 34. Set the learning goal/benchmarks or objectives (GO). Identify the benchmark(s) as declarative or procedural, and break it down into the daily objective(s). Access prior knowledge (APK). Strategies include non-linguistic representations, advance organizers, and cooperative learning, for example. Acquire new information--declarative or procedural (NI). The difficulty is selecting of the type of strategy that helps learners retain each type of knowledge. Lecturing is one way. However, learners might be involved with "note-taking, using a thinking skill as a scaffold organizer, creating a graphic organizer," questioning, and cooperative learning (e.g., pair/sharing) (p. 71). Multimedia presentations also help acquire new information. Apply thinking skills or real-world situation (APP). Pollock indicated, "When planning for the application of declarative knowledge, thinking skills (e.g., comparison, analysis, persuasion) can help learners organize and reorganize facts, leading to longer retention...and how to use the information in a constructive manner" (p. 68). Acquiring procedural knowledge might take about 24 practices for competency. Modeling helps students become more comfortable with applying procedures. Generalize or summarize back to the objective/benchmark (GEN). Students should be involved with closure to a lesson. Strategies that might be used during the last 5-7 minutes of a class include "writing to a prompt, sharing aloud with a partner, summarizing using a strategy, or briefly drawing a pictograph depicting the gist of the topic for that lesson" (p. 69). Here's where a reflective journal might be a tool. Assign homework, if necessary (HW). Both the instructional plan and the assessment plan should address thinking skills, evidenced by verbs within Bloom's Taxonomy (knowledge, comprehension, application, analysis, synthesis, and evaluation). Students should know the benchmarks associated with each lesson or unit of study, although for young learners they might need rephrasing in more kid-friendly terms, and have resources so that they can track their own mastery of the benchmarks. 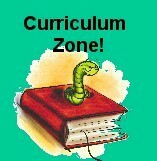 The Oregon Department of Education: Glossary of Curriculum, Instruction, and Assessment Terms. Glossary of Education Reform is a comprehensive resource that describes key school improvement terms, strategies, and concepts. There are at least 500 terms and 150 in-depth entries. "Each entry includes a general definition of the term, a discussion about how the concept or strategy intersects with efforts to improve school performance or student achievement, and an overview of related debates, including the major arguments for or against particular reforms." (About section). For example, popular terms include curriculum, scaffolding, assessment, standardized test, 21st century skills. Think about adopting textbooks that include multimedia. Multimedia provides the multiple means of representation, engagement, and expression to customize learning. A Guide to Curriculum Mapping: Planning, Implementing, and Sustaining the Process by Janet Hale (2007) is a step-by-step guide, which examines the stages of contemplating, planning, and implementing curriculum mapping initiatives that can improve student learning and create sustainable, systemic change. Heidi Jacobs contributed the foreword. Curriculum21: Heidi Jacobs provides resources for curriculum mapping. Galileo Educational Network: Creating Essential Questions by Pat Clifford and Sharon Friesen, who explain the key components. Atlas Curriculum Mapping is web-based from Rubicon International. Curriculum Mapper is a tool to align curriculum to standards and school improvement goals. It was originally developed by Collaborative Learning and is available from Curriculum Technology. TeacherEase provides standards-based curriculum mapping on the web. State standards are pre-loaded, but districts can add their own standards, too. The product has other features to help teachers manage their instruction, including lesson planning, gradebook, report cards, and parent access. There is a fee. Montgomery Public Schools (MD) course pages for math contain expectations, essential questions, enduring understandings, indicators, and vocabulary, illustrating stage 1. ASCD Resources for UbD include the overview of stages, books, articles, and more. Need more curriculum mapping examples? Common Core's Curriculum Maps in Mathematics (P-5) provided at K-12 Blueprint include a 180 day plan for each grade level. Common Core Problem Based Learning Curriculum Maps for grades 3-8, integrated math for grades 9-11, algebra 1, geometry, and algebra 2 are provided by emergent math. Each unit of study has multiple problems and tasks mapped to the associated Common Core math standards. EngageNY Year Long Draft Curricular Maps in ELA and Mathematics for the Common Core standards. The Center for the Study of Curriculum (CSC) at Michigan State University, founded in 2012, "focuses on research related to curricular issues in K-12 schooling, assessment theory, and the effects of curriculum on academic achievement. A special focus concerns the Common Core State Standards for Mathematics, teacher education and preparation, and student achievement. Other research topics include educational policy related to mathematics, science education, and testing in general" (Description, para 1). Morehead, P., & LaBeau, B. (2007, Apr. 12). Beyond curriculum mapping; Using technology to delve deeper into inquiry learning. T.H.E. Journal. Retrieved from https://thejournal.com/articles/2007/04/12/beyond-curriculum-mapping-using-technology-to-delve-deeper-into-inquiry-learning.aspx Pamela Morehead, Ph.D., and Barbara LaBeau discussed how staff at an elementary school used curriculum mapping, study groups, and an onsite technology coach as their model for professional development. Staff used a self-study process to evaluate their use of technology in the classroom and a district technology integration initiative called Project 2000. Conley, D. T. (2011). Building on the common core. Educational Leadership, 68(6), 16-20. Guskey, T. (2005). Mapping the road to proficiency. Educational Leadership, 63(3), 32-38. Jacobs, H. H. (Ed.). (2004). Getting results with curriculum mapping. Alexandria, VA: ASCD. McTighe, J., & Wiggins, G. (2004). Understanding by design: Professional development workbook. Alexandria, VA: ASCD. McTighe, J., & Wiggins, G. (2005). Understanding by design: Expanded 2nd edition. Alexandria, VA: ASCD. McTighe, J., & Wiggins, G. (2011, Spring). Do we need an assessment overhaul? Baltimore, MD: John Hopkins University, Better: Evidenced-based Education, 16-17. Oliva, P. F. (2005). Developing the curriculum (6th ed.). New York, NY: Allyn & Bacon. O'Shea, M. (2005). From standards to success. Alexandria, VA: ASCD. Pollock, J. E. (2007). Improving student learning one teacher at a time. Alexandria, VA: ASCD. Popham, J. (2007). The lowdown on learning progressions. Educational Leadership, 64(7), 83-84. Tomlinson, C., & McTighe, J. (2006). Integrating differentiated instruction & Understanding by Design. Alexandria, VA: ASCD.